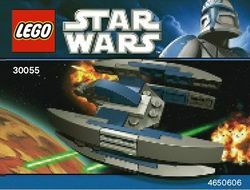 Set 30055 Droid Fighter is a Star Wars: The Clone Wars mini set that was released in 2011. The fighter is built mainly out of Blue and Dark Stone Grey parts, with a few in Medium Stone Grey, and Black. The wings/legs' position can be adjusted, and the 'head' can be swung back. The set was released on September 2011 at Toys "R" Us and also given away free with the Sun newspaper on Saturday 3 December 2011. The Droid Starfighter, or Vulture Droid, was used by the Trade Federation, and later the Confederacy of Independent Systems (CIS). It was armed with four blaster cannons, and two torpedo launchers. It could transform from walking mode to flight mode. The Droid Starfighter had no pilot. Instead it was controlled by a droid 'brain' that was linked to a Droid Control Ship. Facts about "30055 Droid Fighter"